A former Attorney General and Commissioner for Justice in Osun state, Rt (Hon) Barr 'Niyi Owolade, a lawmaker representing Ife South Constituency in the state, Hon. 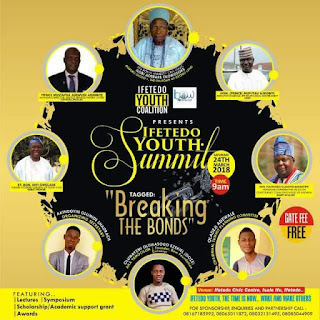 Folorunsho Bamisayemi and the Chief Executive Officer of Gestod Services Limited, Mr. Adewumi Adegbite are the guest speakers at Ifetedo Youth Summit to be held tomorrow, Saturday. At the summit organised by Ifetedo Youth Coalition and powered by Build Our World Foundation would also have in attendance, Mr Olasoji Adegoke as one of the speakers. They will speak on political issues and other issues that will propel human and infrastructural development. A statement issued by the founder of Build Our World Foundation, Oluwayemi Oluwasogo Ezekiel said sons, daughters and friends of Ifetedo community, home and abroad are expected at the summit. The statement reads, "this summit is aimed at encouraging selfless contributions of people towards Ifetedo's development, give academic support/grant to indigent students of Ifetedo who are on Second Class Upper and above in tertiary institutions. "This summit will also encourage youth involvement in politics without violence and anarchy as we approach elections in 2018 and 2019. This will ensure peaceful coexistence before, during and after elections."